Here's it is the first Thursday in August and we're starting a new challenge over at Crafting with an Attitude. Our sponsor this month is Beccy's Place and I've used this magnificent Gull from her "Smooth Seas" set. I started by coloring with my ProMarkers and then did the background using a dried out marker as a water color 'paint brush.' I dipped it into the water color, let it absorb quite a bit, dabbed it once on a paper towel, then used it to 'paint' both the sky and the water. I had to dip several times to complete both the sky and the water. The marker I chose was actually an old blender so I didn't risk any color being left in the marker. Old alcohol markers don't mix well with the water, even when they are dried out. I really like the broad, chisel-tip look it gave me which I can't get with any of the water color paint brushes I have. I used a white gel pen to make the foam around the pilings. I cut the image with a stitched, Cheery Lynn, die. I did the same with the printed sentiment but I trimmed off the top since the small square die was larger than I wanted. Both of those pieces were mounted onto a confetti CS base. I dug through my ribbon stash, found that blue ribbon, and used the last I had to wrap around the card front and then make the multi-loop bow with my bow maker. I think this made a wonderful masculine card and I'll have it in my stash for future use. This is gorgeous Connie, love the design and wonderful image. This makes me want to head out for the closest beach! Love that image and the way you used it on your card. This is stunning! I love scenes with seagulls and pilings and water and this one is perfect! So relaxing! A wonderful card Connie, gorgeous image and lovely ribbon. This is a great card with that fantastic digital stamp from Beccy. What a wonderful card NC, you've done a great job putting it together. I love the background you painted... thanks for explaining the process to us. I also like the way you applied the white pen to the bottom of the pillars for the water effect. The blue ribbon bow finishes your card perfectly. Love it! A lovely card, thanks for sharing with Digistamps4joy! OH! this is so lovely, makes me need a visit to the sea, a Fabulous make Connie. Lovely card ! Thank you so much for taking part in my 'sun, sea and sand' Challenge over at Country View Challenges. 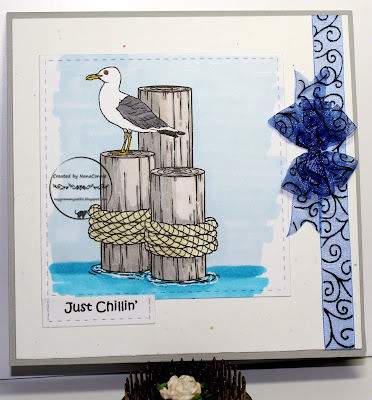 Hello… Thanks for sharing your lovely card with us at Scribbles Designs… your seagull card fits perfectly with our “Fun in the Sun” challenge theme… Hope you will be able to join us again very soon and Good Luck in the draw. Hi Nana Connie, what a cool and elegant combination and love the sentiment you combined with the "quite scene".